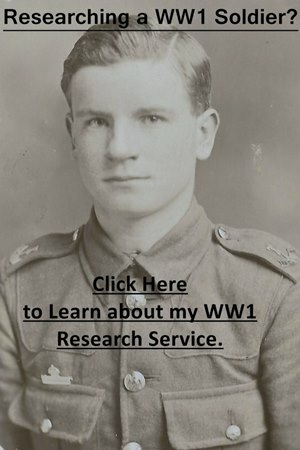 What were WW1 Casualty Lists? At the start of the war, it was decided to publish casualty lists for soldiers who were reported killed, died, wounded, or missing. The Daily War Office Casualty List was first published on 1 September 1914 and reprinted by several newspapers until August 1917. In August, it was decided that newspapers would no longer be able to print the casualty lists in full due to its length and the shortage of paper. Instead, the daily casualty lists were published as the Weekly Casualty List by His Majesty’s Stationery Office and sold for 3 pence each. These later casualty lists have been digitized and are available to search on FindmyPast. The following newspapers carried the daily casualty lists and have been digitalized in recent years. Many local libraries have free access to The Times Digital Archive and I have written a guide on how to use this great resource below. 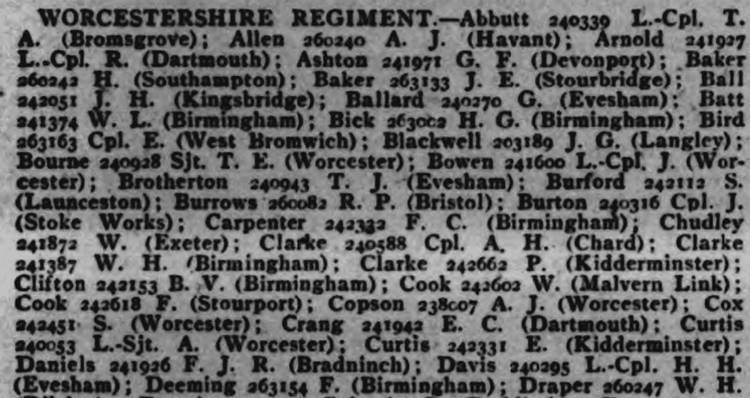 Local newspapers often published casualty lists of soldiers from the local area or battalion/regiment. I have written another guide to using local newspaper reports in your research. Casualty lists can be difficult to use, due to the trouble of finding a soldier among over four years of records. Newspapers of the period used a print far smaller than that found today and names are not always picked up when searching a newspaper’s online digital archive. The Genealogist has digitised the casualty lists, enabling you to quickly search via a name (only initials were used), regiment or service number, as well as by the nature of the casualty, killed, wounded etc. Unfortunately, the only way to access the casualty lists is to join the website under its diamond membership, which at £120 for the year (there is currently a £59.95 four month option) is prohibitively expensive. However, you can often find the information you need by searching digitized casualty lists which I have explained below. The extract below was taken from the Daily List of 29 September 1917 which appeared in the Weekly Casualty List 2 October 1917 showing soldiers of the Worcestershire Regiment who had been wounded. The location after their names is usually where a soldier was from but can also be where they enlisted. On the search screen set the dates you would like to search between. Have a look at a soldier’s Medal Index Card, if there’s a date of entry this is your starting point. If a soldier is only entitled to a British War Medal and Victory Medal you can begin your search from January 1916. You can also look at a unit’s war diary to work out when it went overseas and also when it suffered heavy casualties. Enter your search term. If you are looking for a soldier with an uncommon surname just enter this. If you are searching for a Smith, Jones etc. enter the surname and their service number. Only initials are used for forenames and I would suggest you start your search with their surname and service number first. After your search, you will be presented with a list of results, on the left hand-side of the screen click people . Once the screen has refreshed on the left-hand side click on deaths (don’t worry if you are searching for a wounded soldier they will still appear) which will narrow the results. Hopefully, you will now have a number of possibilities in front of you. If you click on the image of a newspaper by each result it will show you a snippet view and you can usually see whether or not you have the relevant casualty. If the snippet view is unclear, click on the full view button, the search result will be highlighted on the page. The search doesn’t always pick up a name or service number as the recognition software isn’t perfect. To increase your chances, search surname and service number, then surname and finally just the service number (see below). If you are searching for a soldier with a common surname or low service number you can narrow down the date by looking at when a particular unit was heavily engaged. If you know the exact unit the soldier served in, click on this link (CWGC Find Dead) and start typing the unit into the regiment box and click on it once it appears. Then click on unit at the bottom which is below More Search Options and type in their battalion number etc. and search. Once the results have appeared click on the box which says relevance (above the results on the left hand side) and click date of death and look for dates on which large numbers of men were killed. Once you have a list of these dates, narrow down The Times search dates to between 4-6 weeks after this date and search using your surname or service number. The soldier you are looking for may not have been wounded on these dates but the majority of soldiers from that unit would have been. The British Newspaper Archive has been digitising British and Irish newspapers which are held in the British Library’s collection for a number years. As of September 2017, over 21.7 million newspaper pages are available from over 700 different newspapers. Over 100,000 newspapers have been digitized for the period between 1914-1919. Casualties were often reported in local newspapers accompanied by a photograph and official casualty lists were regularly scanned for men who served in local regiments. In July 2017, the War Office Weekly Casualty List was digitized and added to the collection which contains casualties from August 1917 onwards. The British Newspaper Archive is best viewed on FindmyPast, a subscription-based website which has free access for the first 14 days. Clicking on the banner below will take you to the Findmypast website where you can sign up for your free trial. I would recommend searching using a soldier’s full name, service number, regiment and then a combination as the technology used to search the newspapers does not always pick up results. For unusual surnames, just search the surname and set the date filter which can be found on the left hand side to between 1910-19. You can also search by newspaper title so if you know where a soldier was living target newspapers to that area. If you are searching for a Scottish soldier or a soldier who served in a Scottish regiment The Scotsman newspaper is likely to yield a result. Newspaper reports often gave the casualties or their parent’s address in the form of ”Mr and Mrs Smith of 123 Church Street have received a telegram…”. If you know the address, search that as well. If searching the Weekly Casualty Lists from August 1917, then use the tips found in searching The Times digital archive above. The first issue will appear on Tuesday 7th August. The lists will be sold at the price of 3d [pence] per copy to cover the cost of production, or post free 4d. It is thought that the publication of the casualty lists in this form is the most suitable method of making available a complete record of casualties, and should the demands for these lists seem to warrant it, copies of the previous list issued to the Press during the last 3 months, but not published in full by any paper, will also be placed on sale.